Marcus Junius D. f. M. n. Silanus was a descendant of the noble Roman house of the Junii Silani. He struck coins in 33 BC as Quaestor pro consule and Augur together with Marcus Antonius. 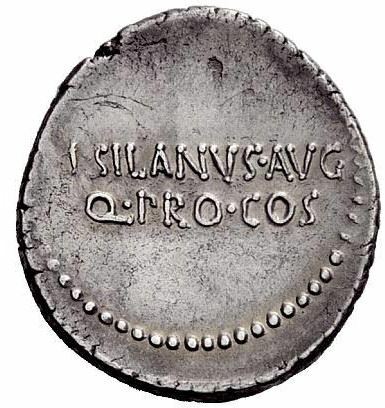 Silanus was probably the son of Decimus Junius Silanus, consul in 62 BC, and Servilia, and perhaps the grandson of Marcus Junius Silanus, consul in 109 BC. Before the Battle of Actium, Silanus went over to Octavian. The future emperor raised him to the Patriciate in 30 BC, and they held the consulship together in 25. Silanus' grandson, Marcus Junius Silanus Torquatus, was consul in AD 19, and married a great-granddaughter of Augustus.